Fast purity analysis of ssRNA and ssDNA oligonucleotides using UV absorption. The OLIGO PRO II is employed in the determination of ssDNA and ssRNA oligonucleotide purity. Parallel capillary electrophoresis coupled with UV detection to provide single nucleotide resolution and direct assessment of oligonucleotide purity eliminating the need for intercalating dyes and fluorescent probes. 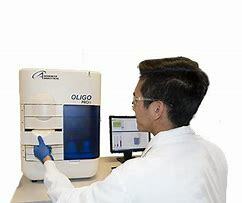 With 12-capillary, 24-capillary and 96-capillary arrays available, the OLIGO PRO II quickly adjusts to meet changing throughput demands.